Effectively monitor sub-surface water in and around your mine with a comprehensive wireless hydrogeology sensor monitoring system. Operators of both surface and underground mines often have to contend with the presence of groundwater in and among the soil and rock deposits present in the earth’s crust. Very often this water is contained in confined or unconfined aquifers (water-bearing sand, silt, gravel, layers of permeable rock or rock fractures). Studying the distribution, movement and behaviour of this water (called hydrogeology, or sometimes geohydrology) is important for mine planning and the safety and productivity of ongoing mine operations. Allied to a theoretical study of these water deposits is a practical application, monitoring. 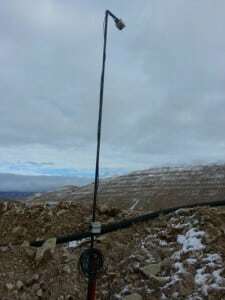 In many modern mines, this means installing and gathering data from wireless hydrogeology instruments (e.g. vibrating-wire piezometers) and interpreting and using the data to enhance planning and make day-to-day operations more efficient and safer. The most efficient way to simultaneously monitor instruments and gather data is to install a comprehensive wireless hydrogeology monitoring system. The Loadsensing LS-G6 Surface Wireless Data Acquisition System is ideal for this application. This versatile system is capable of wirelessly monitoring a large number of vibrating-wire piezometers and other commonly used type of geotechnical and hydrogeology sensors. Ideal for surface environments that are often harsh and remote, the Loadsensing LS-G6 system is robust, has very low power requirements and is fully wireless with an effective range of up to 15km. Fast, simple configuration, built-in user-customizable alarm/warning capabilities, and the ability to interact with Android devices and a web-based interface add to the appeal of this system. The Loadsensing LS-G6 Wireless Data Acquisition System really is the best choice for controlling the wireless hydrogeology sensors that monitor sub-surface water bodies and aquifers in and around your mine.